LIVINGSTON, NJ--(Marketwired - April 21, 2017) - Med Ad News -- the leading pharmaceutical business and marketing publication -- announces the winners for the 2017 Manny Awards, celebrating the best in the healthcare communications industry. The black-tie gala affair occurred last night at Pier Sixty in New York City with 500-plus people in attendance. Twenty awards were bestowed throughout the night to healthcare agencies achieving excellence in various categories. 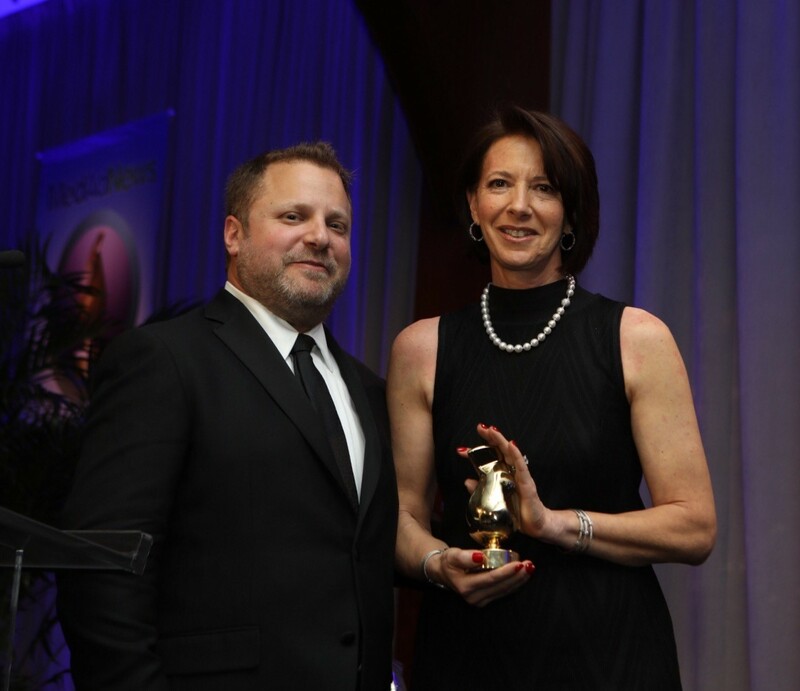 Dana Maiman, CEO and president of FCB Health, was honored as Med Ad News' Industry Person of the Year. Dana brings the intellectual prowess and strategic rigor of a legal education to her position as the CEO and president of the FCB Health family of companies worldwide. Also a member of FCB's Global Executive Team, Maiman has combined her strategic orientation with a single-minded commitment to client service, resulting in the healthcare network's impressive growth under her leadership. In recent years, she has broadened her focus from one office -- FCB Health -- to a network of companies including Area 23, FCBCURE, FCBHalesway, FCBVIO, Hudson Global, ICC London, Mosaic, Neon, ProHealth, and TBD (The Branding & Design Group). With 20 years of client service and healthcare marketing experience, Dana has worked in virtually every therapeutic category, ranging from antibacterials, women's healthcare, and cardiovascular to diabetes, oncology, and HIV in a multichannel fashion, integrating professional, consumer, patient, payer, and digital. Capturing the Category I Agency of the Year award was Area 23. Category I agencies generate annual revenue exceeding $50 million. After a banner 2015, the New York-based agency produced another explosive year in 2016, breaking all of its own records once again including its revenue total, Area 23 also expanded 55 percent in size and finished the year with 325 employees and more creative recognition than in any prior year. A member of the FCB Health Network, Area 23 also garnered four other Manny Awards during the evening: Most Creative Agency, Most Admired Agency, Best Medical Device Campaign (The Breakthrough Cancer Pain Moment - Lazanda), and Best Interactive Physician Campaign (Time Hides Alz). McCann Echo, based in Mountain Lakes, N.J., was recognized as the Category II Agency of the Year (agencies with yearly revenue between $25 million and $50 million). 2016 represented another year of consecutive growth for McCann Echo, starting with new partnerships, continuing with long-standing relationships, and building with a nearly pitch-perfect year of new business wins. A McCann Health Company, McCann Echo won nearly 100 percent of its business pitches throughout 2016. McCann Echo also received a Manny statue in the Best Consumer Campaign category for the "Toddler Tips Sleep Awareness Campaign." On behalf of the entire healthcare communications industry, Med Ad News presented the 2017 Heart Award and $5,000 to Sunayana Dumala and Intouch Solutions. In February, Sunayana's husband was tragically killed in an act of terrorism in a restaurant in Kansas. In the days following the tragedy, her colleagues at Intouch were struck by Sunayana's bravery and also her plea at a news conference two days following the event. Sunayana said she wanted to come back to their home in south Olathe, Kansas, fulfilling her husband's wishes for an American life and "me being successful in any field I choose." New York-based TBWA\WorldHealth was the Vision Award winner. TBWA\WorldHealth took its Disruption Live team to client TedMed's annual conference during 2016, and that team harnessed the power of each talk at the conference by providing tools for healthcare innovators and entrepreneurs to express their game-changing ideas. The Med Ad News "MedAdvocate" jury was once again instrumental in helping determine the winning Manny Award creative campaigns. The panel convened via a roundtable discussion to review and discuss each of the creative award finalist campaigns previously determined through online voting. The MedAdvocates were each assigned specific campaigns and tasked to initiate meaningful dialog amongst the jurors. MedAdvocates were selected based on their creative expertise and widely recognized performance within the industry. Ultimately, the team scored each finalist campaign using a point system that, combined with the popular vote conducted online, arrived at the eventual winners that were crowned last night. The Best Professional Campaign Manny Award was bestowed upon Heartbeat, which was also a finalist for Agency of the Year Category II and Best Interactive Physician Campaign. Heartbeat's winning professional campaign focused on postherpetic neuralgia (PHN), a condition that manifests in a feeling of excruciating pain that lasts long after the rash and blisters of a shingles case have cleared. PHN pain is so significant, it can wreak havoc on patients' lives, often leaving them in so much pain that they are unable to put clothes on in the morning. Horizant's "Naked Truth" campaign depicts this as an evocative human moment that truly illustrates the pain that PHN patients experience while they wait for a slow drug to kick in, or when the effects of one of their treatments wears off before the next dose. For Best Interactive Physician Campaign, GSW captured the award with its "Meet the Puffagins" work. When people with COPD use Atrovent HFA correctly, they breathe better. But many do not, and instead of realizing their mistake, they just think Atrovent does not work. To help with this problem, GSW created the Puffagins, a clan of cloudlike characters who prompt patients to puff throughout the day. FCB Health gained the Manny Award in the Best Nonbranded Campaign category for "Her Endometriosis Reality." The goals of the campaign were to educate physicians about what it actually means for women to have unresolved endometriosis pain, and to encourage them to ask their patients specific questions about how pain may be impacting their lives. ghg | greyhealth group captured the 2017 Manny for Best Point of Care Campaign with "It's Best to Test." ghg needed to create tools to facilitate a dialogue about routine CT/NG screening, help healthcare professionals establish office screening protocol, and educate patients. Within a year of this program's launch, Quest Diagnostics processed 11.5 million tests. With all of the healthcare agencies in the Med Ad News community extending their assistance through various philanthropic efforts, AbelsonTaylor won the vote for Best Philanthropic Campaign with "Power of One." Through the Power of One pop tab campaign, AbelsonTaylor increased its amount of tabs collected by over 600 percent, which added up to more families being able to stay close to their child at a Ronald McDonald House. For Best Self Promotion among the healthcare communications agencies, McCann Healthcare was recognized as the winner with its #GoodPress campaign. McCann sent out more than 100 packages that included origami-size paper ­filled with the "bad news" of 2016, as well as a link to a website hosting instructional videos and steps so others could fold their own shapes. Each shape represented different ways to bring about good news within your life in 2017, for health, moving forward, work, social life, stress, frustration, and even Game of Thrones. As the Med Ad News Manny Awards event annually recognizes the excellence in creative for healthcare brands, this year's theme celebrated content and creative that is "not able to be forgotten … or removed." Participating agency creatives were invited to design and submit tattoo artwork that best represents the healthcare advertising industry and the creativity required to e­ffectively communicate in life sciences. The Med Ad News team selected Palio's "Golden Ratio" tattoo artwork for capturing the balance of precision and creativity and leaving an indelible mark in healthcare communications. The Golden Ratio is a number used by artists, architects, and designers to yield "divine proportions" in their designs. This concept is symbolic of the harmonious relationship that exists between the science community and creative advertising.